A meridian is an imaginary line between north and south poles through the observer's position. Your meridian right now is different to mine, or slightly different to the person next to you, or your teacher etc. The prime meridian is used as a reference for time conventions. It is a meridian from which others are measured. Culmination is when a star is at the highest point in the sky (which should be along the meridian). The meridian is where the sun will be highest at local midday. This is local sidereal time so someone on a meridian in London will see the see culminate earlier than someone in Bristol, 2° to the west. This is the angle between the meridian of the observer and the meridian line on which the star is. We call this line the Hour Circle. We don’t use angles of degrees; as these might not be appropriate depending on the position of the star. We calculate how long it will take for that star to transit the meridian of the observer, so use use hours, minutes and seconds instead. Let’s say an observer is looking at a star due west of their position at 9pm. The star transits the observers meridian at 11.30pm. This is easy – there is a difference of 2 hours 30 minutes. That’s the hour angle. 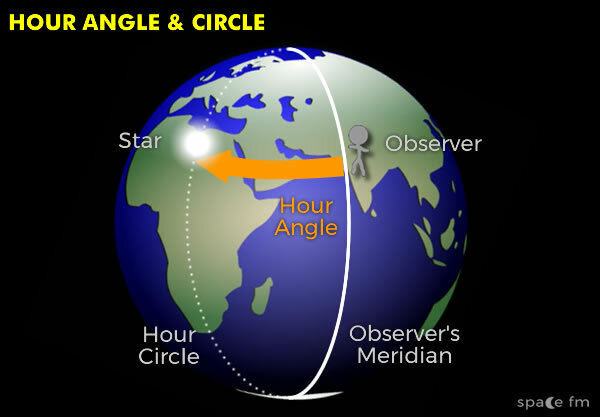 We only calculate westwards so if a star is 1 hour east of the meridian it will be a difference of 23 hours. So how far was the first star (2 hours 30 minutes)? Technically any point on Earth is on a meridian between north and south poles.